Continuing with its trend of featuring gadgets before the official launch, Snapdeal.com has now listed the Micromax Funbook Pro for sale on its site, though it's not been officially released by the Indian phone manufacturer. The tablet is available for purchase at a price tag of Rs 10,000. 1.2 GHz Cortex-A8 CPU, dual Mali-400 GPU, 1 GB of RAM. 1080 video playback with HDMI-Out. 8 GB of internal storage, 32 GB microSD card slot, USB 2.0 port. Inbuilt Wi-Fi, 3G via external dongle (supports only Tata DOCOMO Photon+). 3.7 V \ 5600 mAh battery. The retail package includes an offer to obtain a 3G dongle from Tata DOCOMO at a discounted price of Rs 500. 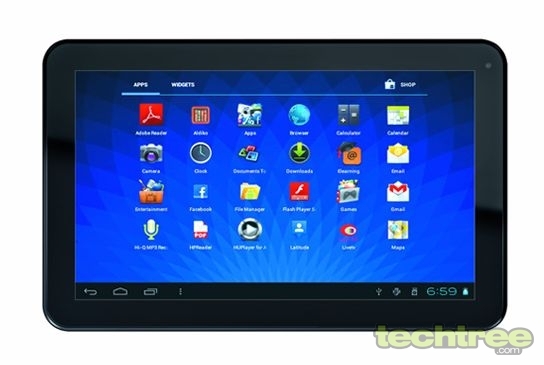 Micromax has positioned this tablet as an "edutainment" device. In addition to support for Google's Play Store, the Funbook Pro offers study material and "interactive" video classes for students, ranging from the primary school to degree sections. It also has courses and sample exam papers for various engineering, medical, and MBA entrance exams. Keep in mind though that none of this is free — the educational material costs extra for each course and has to be purchased separately. Which is probably a good thing, considering that tablets are pretty much useless when it comes to productivity.